Hi! After the Tuesday incident...I'm in need of a good night sleep. Promise! Thankfully, I found time to check on my entry to CleanRest Giveaway hosted by The Girl from the Ghetto and did some of the corrections needed. Yay! $310 CleanRest Complete Set Bedding Giveaway! Nice! :-D Pls. Click on the Image for the Contest Details! 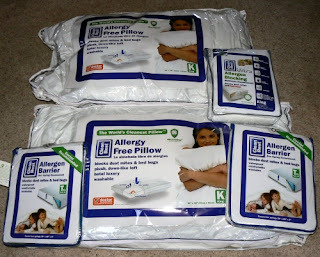 I’ll be super happy and thankful with the allergy blocking pillows. My hubby has asthma, my 5 year old son has regular allergy attacks (runny nose forever…sad), and would love to minimize their medicines intake! I think an allergy free sleep would be a great help to us! :-D So, head over to the official contest site to learn more.